WASHINGTON -- If recent history is a guide, the mass shooting in Aurora, Colo., on Friday is unlikely to move poll results about guns rights and gun control in any lasting way. Thirteen years ago, another shooting rampage at Columbine High School, not far from Aurora, produced a brief bump in support for stricter gun laws, but that new support had eroded a year later and ultimately gave way to a longer-term decline. The Columbine shootings attracted by far the most public interest of any news story in 1999, according to the Pew Research Center. That April week, more than two-thirds of Americans (68 percent) said they had followed the story very closely. The tragedy helped provoke a national debate over gun control laws, which in turn produced a flurry of polls checking Americans' opinions on the wisdom of such laws. A few weeks after the shootings, Pew Research found 65 percent of Americans said it was more important to control gun ownership, while only 30 percent said it was more important to protect the right of Americans to own guns. That was a eight-point jump in those favoring gun control laws (up from 57 percent) since the pollster had last asked the question in December 1993. The post-Columbine bump had faded about a year later, and support for stricter gun laws remained roughly constant over the next eight years. 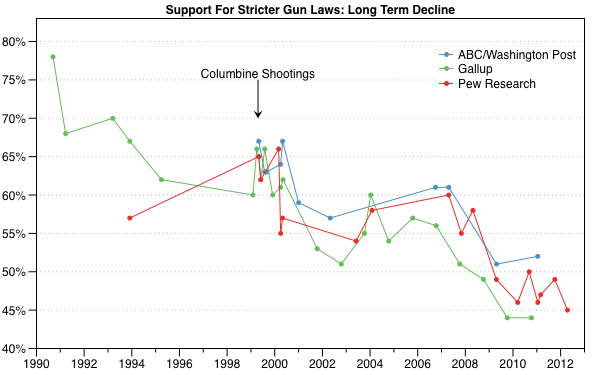 Following the 2008 election, however, support for stricter gun laws dropped off considerably. By April 2010, Pew Research found more Americans placing greater importance on protecting the rights of gun owners (49 percent) than on restricting gun ownership (45 percent). Similar questions tracked by Gallup and the Washington Post and ABC News showed similar patterns. Just after the Columbine shootings, Gallup found 66 percent of Americans saying that laws covering the sale of firearms should be stricter, but by October 2010 the pollster found support for stricter laws had fallen to just 44 percent. Likewise, the Post/ABC poll showed a longterm decline in support for stricter guns laws, dropping from 67 percent in May 1999 to 52 percent in January 2012. The Pew Research surveys show that the increase in support for gun rights since 2007 has occurred mostly among independents and Republicans, creating very wide partisan differences. In Pew's most recent survey, 72 percent of Republicans say it is more important to protect the rights of gun owners, compared to just 27 percent of Democrats. 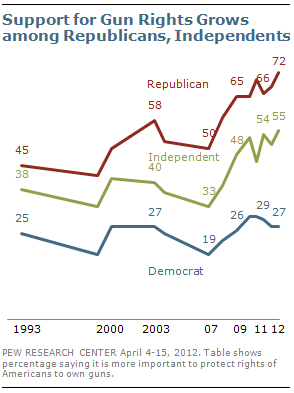 Partisanship does not entirely explain the trend, however. The Pew surveys found that although white Americans are far more likely than non-whites to back gun rights, African Americans' support has increased by 18 points (from 17 to 35 percent) since 2007. As always, these general views on stricter gun laws versus stronger gun rights can translate into very different attitudes when pollsters ask about specific proposals. For example, a CBS News/New York Times poll conducted in January 2011, immediately after the shooting of Rep. Gabrielle Giffords and 18 others in Tucson, Ariz., found that 65 percent of Americans opposed a ban on the sale of all handguns. Yet on the same survey, nearly as many supported a nationwide ban on "assault weapons" (63 percent) and a nationwide ban on "high-capacity magazines" (63 percent). The latest tragedy in Colorado may well produce another brief polling bump, but it is unlikely to shift in attitudes over the long term absent a more fundamental change in the gun policy debate.